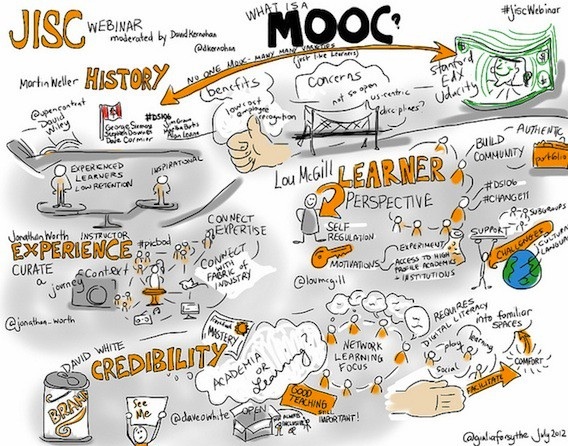 5.2.1 MOOCS: a massive disruption? ...nothing has more potential to enable us to reimagine higher education than the massive open online course ….For relatively little money, the U.S. could rent space in an Egyptian village, install two dozen computers and high-speed satellite Internet access, hire a local teacher as a facilitator, and invite in any Egyptian who wanted to take online courses with the best professors in the world, subtitled in Arabic…I can see a day soon where you’ll create your own college degree by taking the best online courses from the best professors from around the world ….paying only the nominal fee for the certificates of completion. It will change teaching, learning and the pathway to employment. Many others have referred to MOOCs as a prime example of the kind of disruptive technology that Clayton Christensen (2010) has argued will change the world of education. Others have argued that MOOCs are not a big deal, just a more modern version of educational broadcasting, and do not really affect the basic fundamentals of education, and in particular do not address the type of learning needed in a digital age. MOOCs can be seen then as either a major revolution in education or just another example of the overblown hyperbole often surrounding technology, particularly in the USA. I shall be arguing that MOOCs are a significant development, but they have severe limitations for developing the knowledge and skills needed in a digital age. All MOOCs have some common features, although we shall see that the term MOOC covers an increasingly wide range of designs. In the four years following its launch in 2011, Coursera claims over 12 million sign-ups with its largest course claiming 240,000 participants. The huge numbers (in the hundred of thousands) enrolling in the earliest MOOCs are not always replicated in later MOOCs, but the numbers are still substantial. For instance, in 2013, the University of British Columbia offered several MOOCs through Coursera, with the numbers initially signing up ranging from 25,000 to 190,000 per course (Engle, 2014). However, even more important than the actual numbers is that in principle MOOCs have infinite scalability. There is technically no limit to their final size, because the marginal cost of adding each extra participant is nil for the institutions offering MOOCs. (In practice this is not quite true, as central technology, backup and bandwidth costs increase, and as we shall see, there can be some knock-on costs for an institution offering MOOCs as numbers increase. However, the cost of each additional participant is so small, given the very large numbers, that it can be more or less ignored). The scalability of MOOCs is probably the characteristic that has attracted the most attention, especially from governments, but it should be noted that this is also a characteristic of broadcast television and radio, so it is not unique to MOOCs. There are no pre-requisites for participants other than access to a computer/mobile device and the Internet. However, broadband access is essential for xMOOCs that use video streaming, and probably desirable even for cMOOCs. Furthermore, at least for the initial MOOCs, access is free for participants, although an increasing number of MOOCs are charging a fee for assessment leading to a badge or certificate. However, there is one significant way in which MOOCs through Coursera are not fully open (see Chapter 10 for more on what constitutes ‘open’ in education). Coursera owns the rights to the materials, so they cannot be repurposed or reused without permission, and the material may be removed from the Coursera site when the course ends. Also, Coursera decides which institutions can host MOOCs on its platform – this is not an open access for institutions. On the other hand, edX is an open source platform, so any institution that joins edX can develop their own MOOCs with their own rules regarding rights to the material. cMOOCs are generally completely open, but since individual participants of cMOOCs create a lot if not all of the material it is not always clear whether they own the rights and how long the MOOC materials will remain available. It should also be noted that many other kinds of online material are also open and free over the Internet, often in ways that are more accessible for reuse than MOOC material (see Chapter 10). MOOCs are offered at least initially wholly online, but increasingly institutions are negotiating with the rights holders to use MOOC materials in a blended format for use on campus. In other words, the institution provides learner support for the MOOC materials through the use of campus-based instructors. For instance at San Jose State University, on-campus students used MOOC materials from Udacity courses, including lectures, readings and quizzes, and then instructors spent classroom time on small-group activities, projects and quizzes to check progress (Collins, 2013). More variations in the design of MOOCs will be discussed in more detail in Section 5.3. Again though it should be noted that MOOCs are not unique in offering courses online. There are over 7 million students in the USA alone taking online courses for credit, as part of regular degree programs. One characteristic that distinguishes MOOCs from most other open educational resources is that they are organized into a whole course. However, what this actually means for participants is not exactly clear. Although many MOOCs offer certificates or badges for successful completion of a course, to date these have not been accepted for admission or for credit, even (or especially) by the institutions offering the MOOCs. It can be seen that all the key characteristics of MOOCs exist in some form or other outside MOOCs. What makes MOOCs unique though is the combination of the four key characteristics, and in particular the fact that they scale massively and are open and free for participants. 5.2 What is a MOOC? by Anthony William (Tony) Bates is licensed under a Creative Commons Attribution-NonCommercial 4.0 International License, except where otherwise noted.